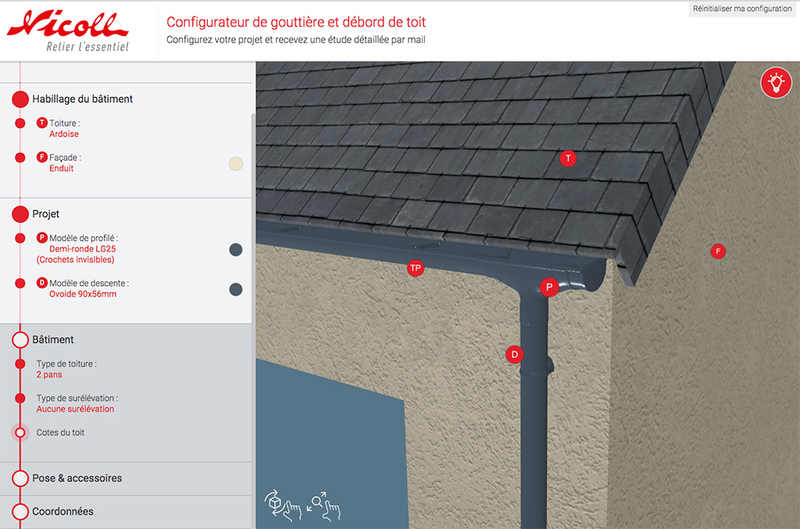 Mazedia had the opportunity to work with Nicoll on the conception of their website and lately a gutter and downspouts online simulator. As a result of our well known “savoir-faire” and our team’s necessary collaborations, we were able to provide Nicoll with all the essential sales support tools. Find out more about this project approach! Nicoll is a French organization headquartered in Cholet, Maine et Loire in the north-west of France, furthermore, using synthetic materials, it manufactures and creates evacuation and fluid management systems, either water and air systems, mainly intended for the construction sector. Consequently, Mazedia designed a gutter and downspout simulators, available on PC or Mac OS, as well as in smartphone and tablet versions, at no cost, therefore, this simulator will allow professional or individual to get the number of gutters and/or roof extension along with a quote from its closest Nicoll distributor around their area in a few minutes. A user-friendly, easy to use, interactive solution, especially relevant as it offers a 3D visualization of the project, as well as so many other features that will attract not only professional contractors but also any customer with an outdoor design project. THE NICOLL GUTTER DESIGN SIMULATOR, HOW DOES IT WORKS? The Nicoll gutter configurator has a “Help & Ask an expert” section to guide you throughout your gutter and/or overhang design project. Thanks to the 3D presentation, you can follow step by step your configuration, and visualize the final rendering. A last-minute change? Modify or reset your project at any time. Finally, once the configuration is completed, the user will receive a personalized document by email.